These days, we’re familiar with heart transplants from brain-dead patients into others needing a new, healthy heart. But in a new experimental breakthrough, successes have been achieved in transplanting the hearts of those not brain dead. Yes, there are procedural and ethical issues involved. Mind you, this involves actual human hearts, not 3-D printed replacements, or bits of heart tissue grown in labs from human stem cells. But the possibility raises some issues of medical ethics to be explored: if the donor is not brain dead, when and by what criteria can the heart be removed? Rather than dig in deeply here, I’ll refer you to the article itself. You’ll see a “reanimated” donated heart actually beating outside the bodies of both donor and recipient. Here's the link. Those “harvested” tissues are useful, but come from aborted fetuses . . . an issue which raises a host of legal and ethical issues, and offends many people. What if there were a way to generate human brain tissue, not from a fetus, but from stem cells generated from healthy adults? In other words, suppose you could let a lab technician take a small sample of the flesh on your hand, and, hey presto! you might soon have small globules of brain tissue for researchers to work with. But then the question, Why would you want a brain in a jar? One reason, among many: if you or your children were suffering from neurological disorders or brain abnormalities, such as autism. Then there might be no need to take actual brain samples . . . or to wait while those abnormalities are studied in experimental animals (which may or may not provide results transferable to humans). 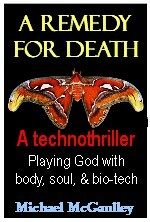 Another question that may come to mind: How does the possibility of growing replica human brains tie in with my medical bio-technothriller, A REMEDY FOR DEATH: Playing God with body, soul and biotech? Excelloent question! You'll find the answer at the top of this blog, or you can can check it out on Amazon. I hope you will. Spraying human stem cells to regenerate severely burned areas--in four days! Imagine collecting a burn patient's own stem cells from an unburned part of the body, placing them in a growth solution for an hour or so, then spraying that solution of human stem cells onto the raw, burned area . . . and in four days having the patient's skin looking fully back to normal. Mind you, growing human flesh to put over burned areas is not new--among others, Organogenesis has been producing that kind of regenerated skin since the 1980s. Trouble is, that method takes weeks, and to protect the patient against infections, an "immediate" new skin is better. And it's here, though still experiemental. Here's the link to the National Geographic video (via the site Big Geek Dad, which is a great source for all sorts of interesting, sometimes off-beat stuff).